Making turkey gravy is simply a matter of stirring pan drippings and a little fat with flour and broth. The giblets are a bonus. Roast turkey or chicken. Rinse giblets and neck. Refrigerate liver until needed. In a medium saucepan combine remaining giblets, neck, celery, onion, and enough lightly salted water to cover. Bring to boiling; reduce heat. Simmer, covered, for 1 hour. Add liver. Simmer, covered, for 20 to 30 minutes more for turkey (5 to 10 minutes more for chicken) or until tender. Remove giblets and finely chop. Discard neck. Strain broth Discard vegetables. Cover and chill giblets and broth while turkey or chicken roasts. 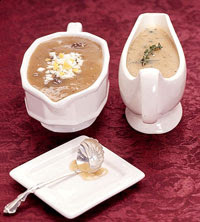 Transfer roast turkey or chicken to a serving platter; pour pan drippings into a large measuring cup. Skim and reserve fat from drippings. Pour 1/4 cup of the fat* into a medium saucepan (discard remaining fat). Stir in flour, salt, and pepper. Add enough reserved broth to remaining drippings in the measuring cup to equal 2 cups. Add broth mixture all at once to flour mixture in the saucepan. Cook and stir over medium heat until thickened and bubbly. Cook and stir for 1 minute more. Stir in chopped giblets. Heat through. *Note: If there is no fat, use 1/4 cup melted butter. Calories 85, Total Fat 7 g, Saturated Fat 4 g, Monounsaturated Fat 2 g, Polyunsaturated Fat 0 g, Cholesterol 56 mg, Sodium 150 mg, Carbohydrate 3 g, Total Sugar 0 g, Fiber 0 g, Protein 3 g. Daily Values: Vitamin A 0%, Vitamin C 1%, Calcium 1%, Iron 6%. Exchanges: Fat 1.5. This entry was posted on 3:51 PM and is filed under Gravy . You can follow any responses to this entry through the RSS 2.0 feed. You can leave a response, or trackback from your own site.